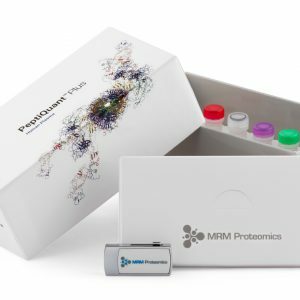 Uses high quality MRM-MS technology to simultaneously quantify up to 125 human proteins from a single plasma sample! Comprehensive internal standards ensure accurate quantitation. The panel includes medium to low abundance proteins associated with cancer, CVD, and other diseases. The PeptiQuant™ Plus Human Plasma Kit is a turnkey solution for multiplexed quantitation of 125 proteins from a single plasma sample. Our rigorous MRM-MS quantitation strategy ensures robust, reproducible, and interference-free measurements. Every PeptiQuant™ Plus assay is thoroughly characterized according to Tier II CPTAC guidelines.